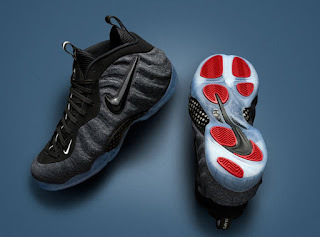 Here is a super detailed look at the new Nike Foamposite Pro Fleece Sneaker releasing at 10am EST HERE at NDC, HERE at Shoe Palace, It has been two decades since the Air Foamposite One first graced the hardwood. While born on the feet of some of the game's best, the Swoosh-branded Foamposite would quickly gain a cult-like following past the court. Now celebrating the icon's beloved 20th anniversary, the Air Foamposite Pro is introduced in a lifestyle-friendly fleece iteration.